The Blowing Rock, a rocky outcropping with amazing views, is North Carolina’s oldest attraction. Scenes to Savor: Blowing Rock’s pedestrian-friendly Main Street is lined with boutiques, restaurants, and a quaint park in the center. Grandfather Mountain features an animal habitat with otters, eagles, and more, as well as a nature museum. Grandfather Mountain rewards with miles of hiking trails and far-reaching views. Ride the Rails: Tweetsie Railroad is loads of fun any time, but it can be markedly enjoyable during one of the many special events held throughout the year. Catch Grammy-winning artist David Holt and the Lightning Bolts on May 27. Day out with Thomas runs June 9-18. Sky High: Ages four and up can take on obstacles and great heights on two distinct courses at High Gravity Adventures. There’s also a three-person giant swing and a ground course akin to that on American Ninja Warrior. Horseback riding is a fun way to explore the lovely grounds of Moses Cone Manor. Sights to Behold: The Linn Cove Viaduct, at milepost 304 on the Blue Ridge Parkway near Blowing Rock, snakes around Grandfather Mountain. Stop by the visitor center at the south end of the viaduct to learn why it’s considered an engineering marvel. Smack in the center of town, Blowing Rock Memorial Park has a playground, gazebo, and picnic tables, and holds concerts as well as monthly Art in the Park shows. Visit www.townofblowingrock.com for details. Julian Price Memorial Park and lake, located at Blue Ridge Parkway milepost 297, sits on 4,200 acres at the foot of Grandfather Mountain. Explore the area via an easy trail that encircles the lake, or rent a canoe or kayak to get out on the water. Let’s face it, when it comes to planning a trip for an all-ages family, it can be tricky to find a place that offers something for everyone, from the in-laws’ toddlers to the moody teens to the grandparents in tow. Blowing Rock is one such town that fits the bill. Attractions to entertain kids big and small, historic landmarks that keep them learning, dining and shopping opportunities the adults will love, and a glut of outdoor fun that even the most non-outdoorsy travelers will appreciate—check, check, check, and check. Situated at 4,000 feet on the Eastern Continental Divide and a hop off the Blue Ridge Parkway, the adorable village of Blowing Rock holds an enviable amount of riches for a town its size and a postcard-perfect Main Street. A place where some 1,200 year-round residents live in cottages tucked down shady lanes or perched on mountainsides, Blowing Rock seems right out of a storybook. And indeed, it is: Resident author Jan Karon used the town as the inspiration for her popular Mitford series. It’s the kind of locale where school children can safely walk home and no one who lives there is a stranger. For visitors, the town’s proximity to an array of attractions, accommodations to fit various budgets, and options for dining and shopping make it a great base for exploring. No matter where you check in (find resources on page 50), here’s a to-do list to make the most of a visit. Want to know how the town got its name? Hint: It has to do with a Native American love story, a precipitous rocky outcropping, and the curious phenomenon of air currents flowing upward. You can learn all about it at The Blowing Rock attraction, where a 0.2-mile paved trail leads to awesome views over the Johns River Gorge 3,000 feet below and stunning peaks beyond, including Mount Mitchell, Table Rock, and Grandfather Mountain. A gallery of historic photos of the town, a gift shop, gardens, and picnic tables make this a pleasant spot to while away an hour. Plan to come late in the day, as this is a perfect place to catch sunset. Do not miss a visit to Grandfather Mountain, perhaps the most iconic landmark in the area, so named because of its grandfatherly profile. Able-bodied, budget-minded travelers may choose to explore the free state park side of the mountain, which offers access to 12 miles of backcountry trails and campsites. Mind you, this isn’t for the faint of heart. Some of the hikes take a full day and require navigating cliffs and climbing ladders. The Grandfather Mountain attraction charges an entrance fee but is worth every penny. 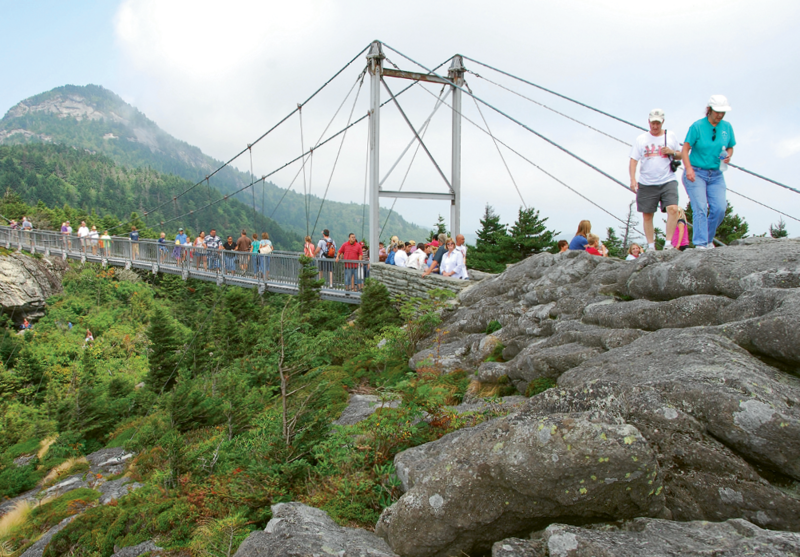 Regardless of your age, the 228-foot Mile High Swinging Bridge is thrilling and accessible, via a flight of stairs or an elevator. Situated a mile above sea level, the 360-degree views stretch far beyond. The Nature Museum has interactive exhibits on climate and weather (this place is known for extremes), plus displays on the unique flora, fauna, and geology of the mountain. And the nearby wildlife habitats are a chance for close encounters with bears, otters, bald eagles, and more native creatures. Go on June 14, when park staff throw a big birthday party for all the animals. Another unique opportunity, and one that requires advance sign up, is the Keeper for a Day program, when children 12 and up get to shadow the keepers while learning all about the animals and their behavior. There are also plenty of hiking trails, so plan a full day to take it all in, then head to Canyons restaurant for dinner and awesome views of the mountain you just conquered. Two other worthwhile attractions are Tweetsie Railroad and High Gravity Adventures, conveniently located adjacent each other. While a Wild West theme park may seem old fashioned, Tweetsie Railroad has an interesting history, and kids of all ages will love it. The attraction is a nod to the railroad that operated from 1882 to 1940 between East Tennessee and Western North Carolina, and Engine No. 12 is one of the few narrow-gauge steam locomotives in operation today. There’s even a steam locomotive maintenance shop on site that repairs engines from across the country. You can ride the rails, meet cowboys, take a gondola to a mining area, pet baby goats and other animals, and take a spin on kid-friendly carnival rides. Tip: If you have children who can’t get enough of Thomas the Train, come between June 9 and 18, when you can meet Sir Topham Hatt and ride on an actual Thomas the Tank Engine. Next door is High Gravity Adventures, a massive ropes course appropriate for ages four plus. The older kids and adults can climb obstacles and rappel on three levels of varying heights and difficulty, while the Foothills Course has climbing elements for younger children. Allow two to three hours here. Another must-see place is Moses Cone Memorial Park and Flat Top Manor, located nearby on the Blue Ridge Parkway. The 13,000-square-foot mansion was the summer home of early 20th-century textile magnate Moses Cone. While you won’t be able to tour the whole house (conservation efforts are underway to preserve it), there is a gift shop selling locally handmade crafts of the highest quality and the grounds are idyllic. Twenty-five miles of carriage trails wind through the 3,500-acre estate. A fun way to experience it all is by horseback. Tim Vines runs Vx3 Trail Rides and offers custom, two-and-a-half-hour horseback rides on the property. Of course the Blue Ridge Parkway provides sights aplenty, but you don’t have to venture far down its path to take in Julian Price Lake and Memorial Park. Named for an insurance tycoon whose family business donated the land to the National Park Service, the park offers hiking, fishing, canoeing, and camping. An easy, 2.7-mile trail circles the lake, but perhaps the best way to enjoy this serene spot is by canoe or kayak, which you can rent for $13 or $10 per hour, respectively, through Price Lake Boat Rentals. Wondering what to do in inclement weather? Blowing Rock Art & History Museum is worth exploring. A handful of exhibits showcase both art and local history. This summer is the chance to take in an exhibition of North Carolina glass artists, while another explores the history of Tweetsie Railroad. For younger kids, two weekly art classes are on offer for $5, with call-ahead notice. Don’t leave town without hiking the 3.2-mile round-trip Glen Burney Trail, which leads to a couple of lovely waterfalls. The best part: The trailhead is in town but the hike takes you a world away, and still allows time to return for ice cream and shopping on Main Street, a beer at Blowing Rock Brewery, and idle time under the park gazebo while the kids take on the playground. It’s postcard-perfect indeed.